Everyday iam always looking for ways to create better colors and style. This giveaway prize is you choice of one dog bow from our shop. 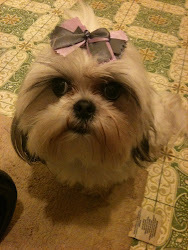 For Velvet it would have to be a small bow for her collar and she looks wonderful in purple! I joined your facebook page and put the word free on your wall. And, I'm following you on twitter.